Sarah Perlman was a typical American young wife and mother. After getting married, she and her Israeli husband, Chaim, lived in Lakewood, NJ, and then moved to Bnai Brak, Israel. Although shy and easily overwhelmed with irrational fears, she still managed her life fairly well, juggling work with raising her family. Life seemed quite simple and good until one day… tragedy! Chaim’s accident and subsequent brain injury turned her life upside down and thrust her into the depths of despair. Join Sari as she strives to save her husband, marriage — and herself. Ride with her on the roller coaster of emotions as she struggles with decision-making and assertiveness. Discover the wise counsel and support of her esteemed and holy Rav, and the warmth and comfort of her dear friend. 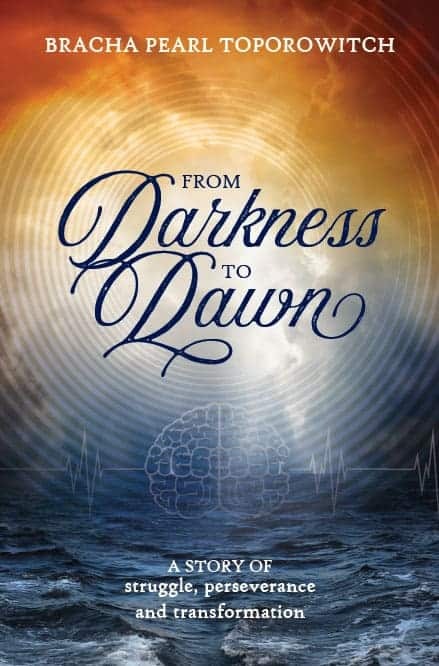 A story of challenge and courage, of struggle and deep faith, From Darkness to Dawn will have you laughing and crying together with its main character. This unique work is a real page-turner! Bracha Pearl Toporovitch was born in London, England. A wife, mother, grandmother, and great-grandmother, she grew up in Brooklyn, New York, and her high school years were spent under the tutelage of Rebbetzin Vichna Kaplan, a”h. After marriage, she lived in Lakewood, New Jersey, during the time Reb Shneur Kotler, zt”l, was Rosh Yeshiva, and then made aliyah with her family. She currently lives in Zichron Yaakov in the north of Israel. She has been working with women in various capacities since 1969, and as a guided imagery practitioner and hypnotherapist since 1999. Mrs. Toporovitch gives shiurei Torah in Hebrew and English and always weaves authentic Jewish hashkafah into her work as a practitioner. She is the founder of the Mind-Body Healing Fertility Clinic in Ramat Beit Shemesh, Israel, and is also the author of At Your Command, the riveting account of the life of her father.